On Sept. 29, 1987, at the NACS Show in Toronto, Chester Cadieux became the first retailer inductee to enter the Convenience Store Industry Hall of Fame, sponsored by Convenience Store News. As we reported then, it was a fitting tribute to the founder, president and chairman of the then-248-store QuikTrip Corp., based in Tulsa, Okla. On that day, Cadieux, a man who had helped shape the convenience store industry for the previous 30 years, became the first in a long line of industry luminaries whose collective entrepreneurship, management style, vision and leadership have forged today's $574-billion convenience store industry. On this, the 25th anniversary of the CSNews Convenience Store Industry Hall of Fame program, we thought it appropriate to pay homage to our previous inductees and recount some of the highlights of the past quarter-century history of the Hall of Fame program. Here, we look back on the honorees from 1997 to 2001. 1997: Jim Yates, E-Z Mart Stores Inc.
More than 600 retailers and suppliers gathered in October 1997 to honor Jim Yates, founder and chairman of E-Z Mart Stores, along with Lorillard Tobacco Co. In addition to hailing his business acumen, Yates was cited for his contributions and service to the c-store industry and to the communities in which E-Z Mart does business. 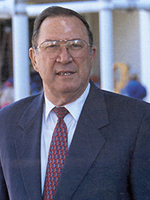 Yates was chairman of NACS in 1992-93 and chairman of the NACS Political Action Committee from 1994 to 1996. "I love the little rural towns," Yates said in an interview with CSNews prior to his induction. "I am not a RaceTrac or Sheetz. I am a niche marketer." The Texarkana, Texas-based retailer had grown to 420 stores by 1997, but in many ways, Yates still saw himself as a neighborhood grocer. "There are three kinds of people in this business today," he said. "The gas man who is screwing up the grocery business; the grocery man who is screwing up the gas business, and I'm the guy in the middle." Following his tragic death in a plane crash in 1998, Yates' legacy lives on. His daughter, Sonja Hubbard is currently E-Z Mart's CEO. And NACS set up a scholarship fund in his name to recognize and support industry store-level employees who demonstrate the potential and determination to someday hold positions of senior leadership in the industry. The supplier inductee that year, Lorillard, was honored for its programs, quality products and outstanding customer service. 1998: Chris Girard, Plaid Pantries Inc.
More than 900 retailers and suppliers attended the Atlanta induction ceremony for Chris Girard, chairman, president and CEO of Plaid Pantries, a 105-store chain based in Oregon. Pinnacle Corp. was the supplier inductee that year. 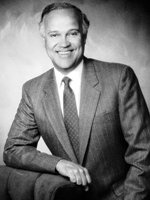 William C. "Chris" Girard Jr. came to Plaid Pantries as an outside consultant tasked with guiding the chain out of Chapter 11 bankruptcy in November 1989. Despite having spent seven years as a U.S. Navy aviator, including two tours in Vietnam, bringing Plaid Pantries back to life (he said the chain was "a hiccup away from liquidation") was a tremendous challenge. Well, nine years later, after creditors asked him to remain with the chain permanently, Plaid Pantries had reorganized out of Chapter 11, its cash flow revitalized with a great balance sheet. "Chris is one of the industry's most enthusiastic leaders," said one retailer. "Chris' leadership has taken Plaid Pantries from bankruptcy to one of the industry's most-respected chains." Today, Girard is still president of the Beaverton, Ore.-based chain that operates 100-plus stores. The Pinnacle Corp. became the first technology company inducted into the Hall of Fame that year -- and for good reason -- back in the days when paper and pencil were the c-store manager's main tools, the technology firm was pioneering a better way to do business. Pinnacle's technology helped free store managers from hours of paperwork in the back office and put them back on the floor, serving customers. 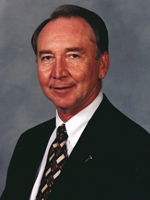 1999: Fred Higgins, Minit Mart Foods Inc.
Fred Higgins' deep commitment to serving others was just one of the reasons the founder of then-88-store Minit Mart Food Stores was inducted into the Hall of Fame in 1999. Among many other honors, Higgins was also a member of the Junior Achievement Hall of Fame, won a National Grocers Association Spirit of America Award, was named Inc. magazine's Entrepreneur of the Year and won a Kentucky Grocer of the Year award. But this former NACS chairman was most proud of his community efforts. "You have to work on your community to make it better," he told CSNews prior to his induction. "I don't care if that community is Bowling Green, Ky., or New York City. It has to do with a concern for where your children will be living and the type of community you will leave them." Asked to name a special ambition, this Hall of Famer replied: "To make a palpable difference." Higgins' deep sense of community was mirrored in his c-store operations. Minit Marts are located mostly in small rural towns where they serve as neighborhood stores offering traditional convenience items, a fair selection of groceries, gasoline, ATMs, and at many locations, video rentals and sales. A decade earlier, the company was a forerunner, jumping into the fast-food business with a proprietary line of sandwiches, breakfast items and baked goods. Higgins also bolstered the stores' fast-food business with branded offerings from Godfather's Pizza, Church's fried chicken, Bullets hamburgers, Taco Bell Express and Baskin-Robbins ice cream at select locations. Higgins' work for the industry has also been substantial and long-running. 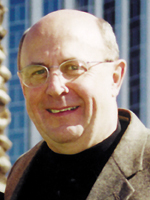 He was a leader for NACSPAC, the industry's political action committee. Sam Rowse of Veryfine accepted the supplier Hall of Fame award for his company that year. 2000: Don Lamberti, Casey's General Stores Inc. 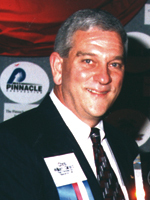 In 2000, the c-store industry inducted Don Lamberti, chairman of Casey's General Stores of Ankeny, Iowa, and Naperville, Ill.-based Eby-Brown Co. in New Orleans. Lamberti's retailing experience began literally on his father's knee, as he grew up working in the family's multi-faceted retail store/gas station, motel, ice and coal business. "It was a coal mining business because that's what Italians did [in Iowa]; they came over to work in the coal mines," said Lamberti, who was chairman of then-1,270-unit, publicly owned Casey's General Stores at the time of his induction. In 1969, Lamberti and partner, Kurvin C. Fish, opened the first Casey's General Store in Boone, Iowa (named after Fish's first two initials). "I put Don in the same category as McDonald's founder Ray Kroc," said veteran supermarket retailer Ron Lamb, whom Lamberti recruited heavily to come over and run the company together. Lamberti and Lamb pumped gasoline and stocked groceries side by side in those early days. Although no longer involved in the company's day-to-day operations, at the time of Lamberti's induction, Casey's had fiscal year revenues of $1.65 billion and total gross profit of more than $325 million, a 12.5-percent increase over the previous year. Today, Casey's is one of the largest company-operated c-store chains, behind only Alimentation Couche-Tard and The Pantry. Al Palma accepted the supplier Hall of Fame induction on behalf of Eby-Brown that year. The Hall of Fame moved back to Las Vegas in 2001, with the induction of Bob Robertson, former CEO of White Hen Pantry Stores, and E.A. Sween/Deli Express, manufacturer of prepackaged sandwiches, as the respective retailer and supplier inductees. Robertson was founder of the Elmhurst, Ill.-based White Hen Pantry convenience chain. Described as a soft-spoken, gentle man with an iron will and an unwavering commitment to his goals, Robertson also had an uncanny knack for knowing what customers want. He successfully expanded the company's coffee offering, adding a lot of flavors and brand extensions. "Customers appreciated it. It was a real home run," said one executive who worked for him at the time. Robertson grew the chain to more than 300 stores by the late 1990s and eventually sold to Clark Retail Enterprises for almost $100 million in 2000. The Chicago-based White Hen continued to exist as a brand until its acquisition by 7-Eleven Inc. in 2007. The fresh-food concept pioneered by Robertson was one of the main attractions of White Hen for the Dallas-based c-store giant. For profiles of the Hall of Fame inductees from 1987 to 1991, click here. For profiles of the inductees from 1992 to 1996, click here.